I agree lets get a dog one too. I bet I could get a really funny pic of my golden retreaver. anyways go sleepy cheetah awsome preditors! ACK!!!! I won't tell Timbre because it'll go to his overly pretty, furry head. LOL I've almost edited the rest of the pictures, so I'll post the other thread tomorrow, so people can see what a ham he is and I'm constantly catching him doing something hilarious. I'll tell you his history. Many of you know I worked at a vet clinic before US immigration reared their ugly heads and caused me difficulty and made me leave my job by revoking my employment papers. While I was there, someone left this kitty on the doorstep one morning. Along with him was a not saying he was an outdoor cat and he was killing wildlife and the anonymous person knew we'd find him a good home. While my great hunter is efficient at catching string and mauling hair ties, there's no way he was killing birds and decimating the ecological balance of the area. Reason?? He's got NO claws. LOL Anyways, we put him in a cage and proceeded to try and find him a home. He is a pure bred ruddy Abyssinian cat, who with papers would sell for at least $400-500. I told my husband about him and how sweet and personable he was. John said NO ABSOLUTELY NOT. Anyways, one day, I had to work late and he picked up our daughter from day care and brought her to visit. I brought them to the kennel and as he's saying hi to the dogs he gets a tap tap tap on his shoulder. I'll give you three guesses who it was and the first two don't count. Needless to say, we got his shots up to date, slapped a microchip under his skin and voila, home he came. If anyone knows anything about Abbysinians, they know they are extremely personable and have striking personalities. Timbre (which means Bell in spanish, because we coouldn't call him doorstep LOL) doesn't demand attention, he takes it. He also sleeps on my hip in the middle of the night and does all kinds of crazy and silly things. So that's the history of the crazy cat who sleeps in my dryer. Honorable mention to Puresouthern's My-My that ended close behind, and to everyone else for the nice entries. Huntress, you may now choose the theme of the next Flash Photo Contest...what'll it be? And most sad of all, last Thursday, my own little white moggie, Daisy-Mae, who had FIV. She was only 10. I have lots of beautiful pictures of my kitties, but was too choked up to post them. At least my folks still have our other 3 cats, who've been pronounced clear of FIV. In case you think Oofy's name was wierd, he was named for the political editor of Punch magazine, a satirical mag that had been running since Victorian times and went defunct in the 80's, when people started to lose their ability to laugh at themselves. ...but I thought there wasn't enough of Duncan in it to use. 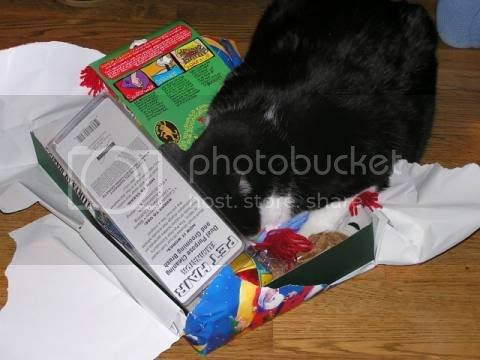 He ripped open his present last year at Christmas b/c it was chock-full of catnip. I love my kitty!!! He's so cute! !